For our third year, World of Walas will bring innovations partners from Europe to Buildex! Buildex is Western Canada’s largest tradeshow and conference for the Construction, Renovation, Architecture, Interior Design and Property Management industries. Over 600 exhibits, and more than 80 educational seminars attract over 14,000 attendees annually. This year, we are expanding on the success of the European Pavilion in 2018 with more partners, new technologies and a full 5-day program. The Walas Trade Mission will introduce our innovation partners to the local and national markets. 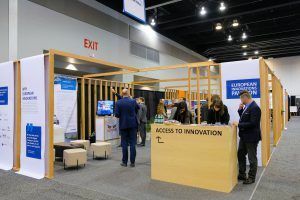 The program includes presentations and networking with local counterparts, experts, government and academic organizations and the opportunity to both exhibit and present at Buildex. For more information on the World of Walas Trade Mission and Buildex, please visit walastrademission.com.